eCommerce websites such as Amazon, Walmart, Target and Jet grew exponentially in 2018. With a huge increase in online sales, these companies began to see some competition but in a different light. In 2018 we saw more focus on social commerce. A reminder to those of you that are not familiar with social commerce, below we provide you with a smashing definition! In a nutshell, social commerce is Instagram, Snapchat and Facebook beginning to integrate online sales onto their platforms. For example Instagram is making is very easy for their users to purchase directly in the feed. 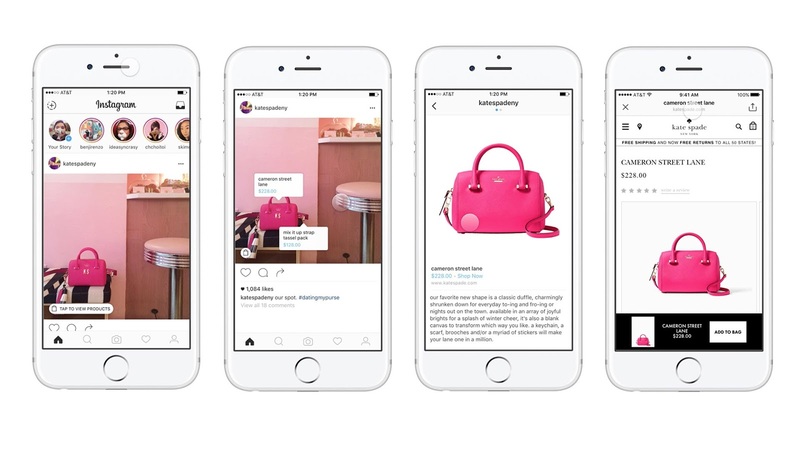 Below you can see an example from Kate Spade and how they are utilizing the new social commerce tools on Instagram. More rumored social commerce implementation for 2019 is focused on Snapchat and the ability to directly purchase on the native platform. Currently, users can swipe up to a website and purchase on the link that they are pushed to but in 2019 we will see an easier way to purchase directly on Snapchat through a quick swipe up. This will be a huge uptick in user purchases on the platform in addition to individuals with large following utilizing the platform more. Don’t be surprised if Facebook and Instagram do something similar with their stories. Kyle and Eli dive more into social commerce and how it will be a game changer in 2019 and 2020 and how you should begin to focus on implementing it in your own eCommerce business. Check out the podcast below where we touch on social commerce in 2019. So, sit back, grab a coffee or beer and enjoy chat on social commerce in 2019 on The eCommerce Buzz!